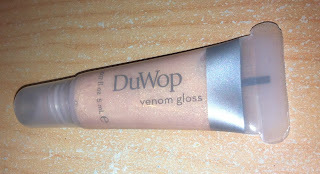 Hello everyone <3 So I thought I'd do a bit of a review on the DuWop Venom Gloss that I had in this months' Glossy Box - I felt compelled to share my thoughts with you! 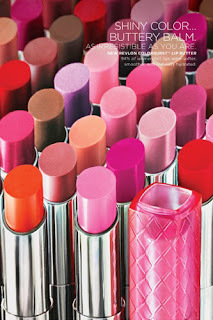 When I saw this product in my Glossy Box I was super excited, a really lovely coloured gloss (I love neutrals!) 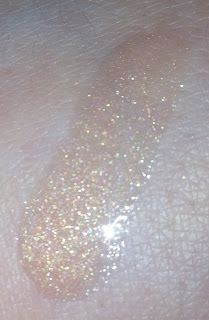 and a lovely helping of sparkle in it too. So I grabbed it from the box this morning and took it into work with me. Once we were a couple of hours into the morning and I'd had my regulation cup of Tea I decided to give it a go and see what it was like. Much to my horror, yes, horror I found it to be horrible! 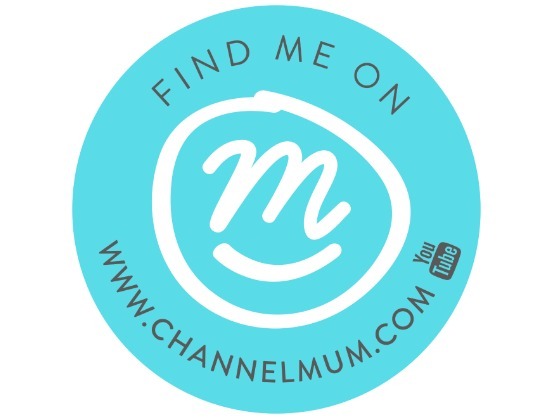 It worked as a plumper, if as by definition I want my lips to feel like they're about to explode in a tingly mess over my face - a slight exaggeration, but they did tingle like crazy! The worst part was how thick and gloopy it was. I applied a normal amount, not very much, and I had to lines on the join of my lips where it gathered and in the corners of my mouth, not a good look! Then, when it started wearing off it became really really sticky, not a nice feeling. I was really disappointed and definitely wouldn't pay for it. 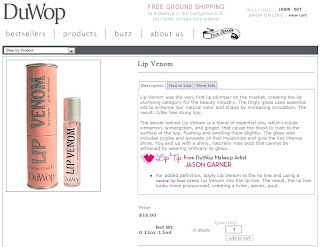 I'm sure there are loads of people out there who love it, and would love it who haven't tried it yet, but for what I like in a lip gloss, it wasn't for me. 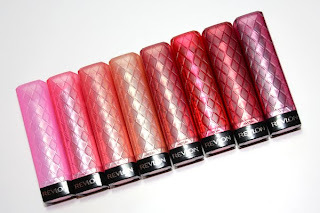 I prefer slightly thinner gloss's, not thin ones, but something like the Revlon Super Lustrious lip gloss - they're the perfect consistancy for me. I find the Maybelline colour sensational lip gloss's slightly too thin - there's no real staying power with them, and the Revlon is a nice balance. Ok so I know this is old-hat for our friends over the pond in the USA, but we don't have these here in the UK yet. I've contacted Revlon, and they're being launched in March, which is any time from 2 days time and the next 4 weeks. To say I'm excited, doesn't quite cut it! I feel like I've been waiting for these forever, and hopefully in about 1 weeks time they'll finally be here! Roll on March! So, just in case you're as excited as me, here's some info on what to expect. Pink Truffle, Sugar Frosting, Raspberry Pie, Tutti Frutti, Brown Sugar, Peach Parfait, Fig Jam, Candy Apple, Red Velvet, Cotton Candy, Berry Smoothie, Cupcake, Gumdrop, Creamsicle, Cherry Tart, Lollipop, Strawberry Shortcake, Sugar Plum, Sweet Tart and Crème Brulee. What Revlon say "Buttery balm with beautiful shiny color to give you baby soft, healthy glowing lips - 94% of women felt lips were softer, smoother, and instantly hydrated." 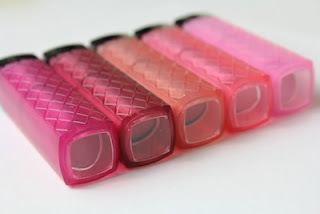 The lip butters are a cross combination of a lip balm, with the colour strength of a lipstick and a lipstick form, whilst having a sheen similar to a gloss. All I can say is, BRING ON MARCH!!!!! So about a week ago I purchased some new foundation. Exciting! 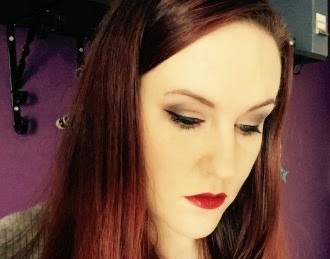 Recently I've been mostly using my Estee Lauder Double Wear, which I've seriously fallen out of love with :( sadface :( I received a couple of small samples of Chanel's vita luminaire and their lift luminaire, which I really liked both of. But I was looking to try something a little different. My skin is getting better and better all the time, so I'm needing less and less heavy coverage. So I popped over to the bare minerals counter in my local dept. store and was swiftly introduced to their Get Started Complexion kit in the lightest shade by a very bubbly woman! 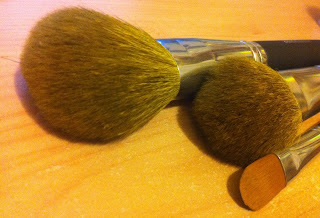 In the box you get 3 x Brushes (a foundation brush, a 'warmth' application brush and a concealer brush), also 2 foundation colours in a slightly smaller size than their usual full size, a 'warmth' (I'll explain after) and a finishing powder. Oh and a primer. The brushes are really soft, the first couple of times you use them bits break off everywhere though! And, lots of the bristles come out - but after that it's not so bad. Other than the brushes here's all the face products you get. The primer is the weirdest texture I've ever known! It's a liquid, but the second it touches your face, it feels like a powder. 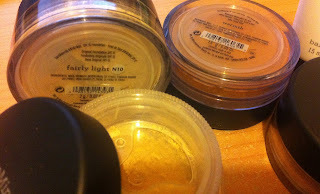 Of the two foundation colours you get in the 'light' kit, I'm currently using the 'light' not 'fairly light' as it is winter and I add colour back in with 'warmth'. The 'warmth' is basically a bronzer. The foundation adds an even colour all over the skin, and the 'warmth' as they call it you put in a 3 and e shape all over your face, which is basically top of the hair line, down the cheek and under the jaw, which is basic contouring. Then you finish off with the finishing powder, which I might add is just lovely :) It's so light and delicate, exactly what you want in a setting agent, nothing heavy. So the first purchase I was and still am, super excited about! 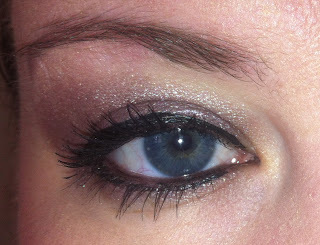 It's the Chanel single eyeshadow in Fauve (90). Lots of the youtube beauty guru's I follow have raved about this colour so I felt it was worth a trip to Chanel to pick up :) And I'll tell you what, it does not disappoint! It's the most beautiful colour, and depending on the lighting, depends on what colour it looks like. It's got brown, mauve and taupe in it. Ok - on to Smashbox :) Really pleased to see them here in the UK and in Cardiff, hadn't seen them here before so I was very happy about that :) I'd initially gone to Chanel to buy their new Spring 2012 blusher, howerver, it was £45 and as amazing as it was, I just didn't want to spend that much money on it, so I decided to get a smashbox blusher instead :) It's in the colour Chiffon - it's a beautiful peach toned blush with tiny teeny sparkly bits in - but not too many :) The blush was about £18. 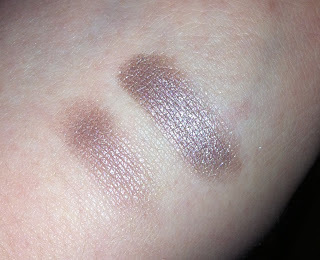 The Chanel nail varnish was £17.50 and the eye shadow single was ..... £22 I think! Since I bought those, I've also been back to visit MAC to pick up the Mineralize Skinfinish blush in Blonde - on launch day here in the UK! So excited! 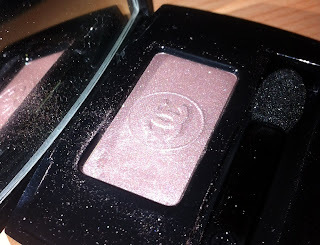 It's so so so pretty, you've basically got 4 pinks running through it from darker to light - the lighest one I'm tending to use as a highlight on the top of my cheekbones, and the darker side as the actual blush, it's actually really nice on top of my Chanel blush in number 18 Orchid Rose or on top of the Smashbox blush. This cost... £22 I think - maybe 50p less, but there abouts.